District Heights, MD – A team of police officers who were serving a search warrant at the wrong house encountered an armed father who was trying to protect his daughter from what he believed were intruders. During a news conference on the incident, George’s County Police Chief Hank Stawinski admitted that a nine-member special operations team went to the apartment when they served a search warrant around 10:30 p.m. on Wednesday. “A law-abiding, hard-working citizen and his daughter were home at the point where we began to execute that search warrant,” Stawinski said. The police chief claimed the warrant was originally granted because a “confidential informant” told officers that a drug dealer was living at the residence. “Our officers had worked to corroborate the information from that confidential informant, however, we did not draw the right conclusion,” he said. According to a report from NBC Washington, when the officers arrived at the home, they “announced” their presence, and then “used a device to open the door.” It is not clear whether they used a battering ram to break down the door, or if they threw flash-bang grenades inside the home to startle the residents. When the officers broke down the door, they encountered a man who was holding a shotgun. He fired a single shot, which Stawinski claimed hit two of the officers who were trying to break into the man’s home. However, when the man realized the intruders were police officers, he dropped his weapon and begged them not to shoot his daughter. “As that door now opens, he realizes that those are police officers. He immediately drops that weapon. He immediately goes to the window and starts communicating, ‘You’ve got the wrong address. Don’t shoot my daughter,'” Stawinski said. While one of the officers returned fire, no one was hit, and the officers who were shot by the homeowner are in stable condition—which is a miraculous ending to what could have been a tragic scene. 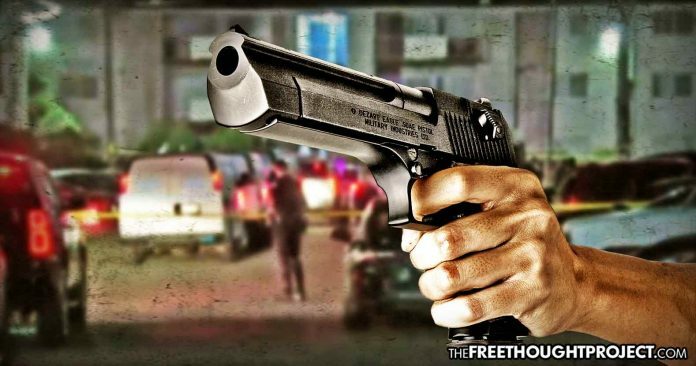 Because police admitted that they attempted to serve a search warrant at the wrong home, because they acknowledge that any attempt to press charges against the innocent man could result in a costly lawsuit, and likely because no one was killed during the incident, Stawinski confirmed that no charges would be filed against the man who shot the officers. “The investigation corroborates his account that he did not know that there were police officers trying to enter his residence. I believe that and I know that to be true,” Stawinski said. The police chief also admitted that his department needs more training when determining search warrants and deciding to break into houses based on rumors from confidential informants. “I am not satisfied that we had done enough to corroborate the information we had in the obtaining of that search warrant,” he said. As The Free Thought Project has reported, this is not the first time a team of police officers has attempted to serve a search warrant at the wrong home. In December 2017, a SWAT team in Chicago raided the wrong house and were reprimanded by the homeowner who demanded an apology, while recording the incident on Facebook Live. Officers began to arrest Cross’s 17-year-old brother, and she said she immediately demanded to see a search warrant for the residence where the officers were initiating the “no-knock” raid. When an officer told her the street address was “8203,” she informed them that they were at the wrong house. Earlier this year, young children were traumatized and injured by flash-bang grenades, an innocent father was terrorized and arrested by police, and their home was damaged, after a SWAT team carried out an early morning no-knock raid on the wrong house in Chattanooga, Tennessee. Homeowner Spencer Renck said he lives at 4040 Lynncrest Drive, and it was not until after the officers damaged his property, traumatized his children and put him in handcuffs that they realized they were at 4030 Lynncrest Drive. However, when they realized their mistake, they simply left and went to raid the house next door as if they had done nothing wrong.